Before January 31st, William Byron had never driven a lap inside of a NASCAR Cup Series car. By lunchtime on that Wednesday, he had already jumped to the top of the standings during this week's test at Las Vegas Motor Speedway. Byron posted the fastest speed in the morning sessions on both Wednesday and Thursday, and he said the new No. 24 Chevrolet Camaro ZL1 "has been really good so far." "It’s shown the speed, and that’s good, and also we feel like we’ve got it driving pretty good," Byron said. "So, hopefully that’s a good thing when we come back here." The 20-year-old driver said the experience of finally getting inside his new Cup Series ride has been, in a word, "awesome." Byron noted that the test has already been tremendously helpful as he continues to build his relationship with the No. 24 team and crew chief Darian Grubb. 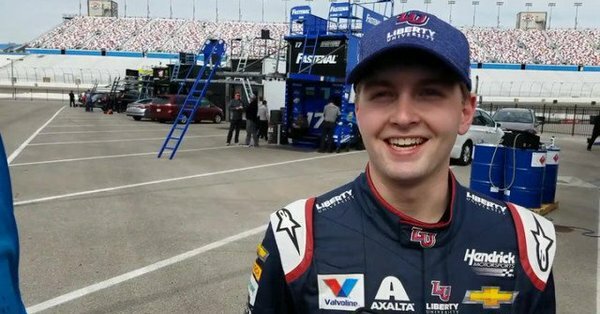 "Young William Byron WILL win a [Cup] race in his first season ..."
Do you agree with NASCAR #RaceHub's Andy Petree? Retweet - YES, he will!